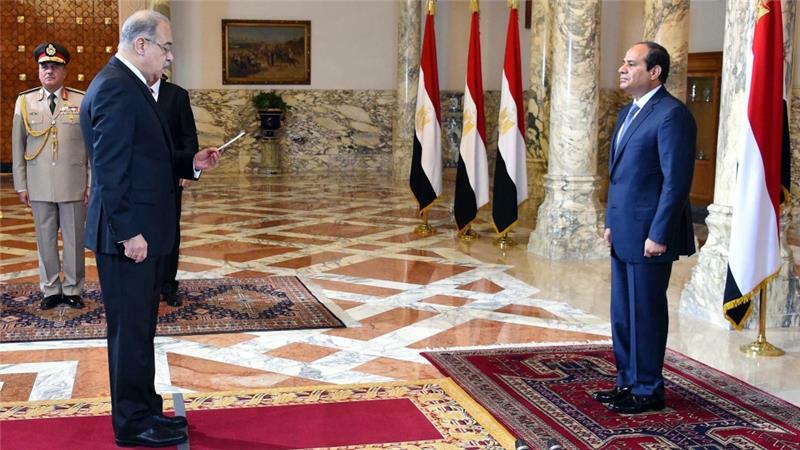 Egyptian President Abdel Fattah Al-Sisi swore in 10 new ministers in an anticipated cabinet reshuffle on Wednesday, state-owned Al-Ahram reported. The new ministers include Judge Hossam Abdel Reheem as Minister of Justice, Dalia Khorshed as Minister of Investment, Amr El Garhy as Minister of Finance, Ashraf El-Sharqawy as business sector minister, Mohamed Saafan as Minister of Manpower, Mohamed Abdel Atty as Minister of Irrigation, Mohamed Yehia Rashed as Minister of Tourism, Khaled El-Anany as Minister of Antiquities, Galal Saeed as Minister of Transportation and Sherif Fathy as Minister of Civil Aviation. The shuffle comes less than two weeks after Ahmed El Zend was forced to resign from his post as Minister of Justice, following “blasphemous” comments about Islam’s Prophet Muhammad. Former tourism minister Hisham Zaazou was also widely criticized for his performance and his “lack of creativity” in solving the country’s tourism woes. Most recently, he came under fire for his choice to play a promotional video showing “simple” Egyptians, including a man on a donkey cart in Luxor who could no longer provide food for his family as a result of the waning tourism industry, at the ITB Berlin tourism convention. Several reports had speculated that Minister of Health Ahmed Rady would be replaced, particularly in light of the Doctor’s Syndicate’s calling for Rady’s resignation for his lack of action in response to the police assault of doctors at the Matareya Teaching Hospital. Doctors have held nationwide protests in response to the assault and referred Rady to the syndicate’s disciplinary board for an investigation into “offensive” remarks. News of the expected cabinet shuffle first broke last month, when prominent journalist and television host Lamis El Hadidy announced she had “insider information” that a cabinet shuffle was imminent. Cabinet spokesperson Hussam Al Qawish initially denied El Hadidy’s report but Prime Minister Sherif Ismail publicly confirmed last Saturday that some ministers would indeed be replaced, saying the swearing in ceremony would take place the following day. However, Sisi rejected all candidates proposed by the Prime Minister and ordered Ismail to submit a completely new list, hence delaying the appointments. Wednesday’s swearing-in ceremony comes just four days before Ismail is scheduled to present the government’s program to the House of Representatives.